Both Superhero Hype and Rope of Silicon point to new international posters for The Dark Knight featured on Omelete.com.br. The one featuring The Joker below is my favorite. Go check out the other four posters at Omelete.com.br. 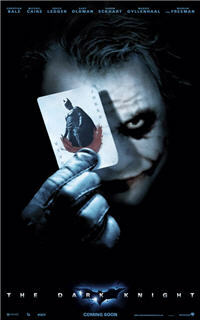 The Dark Knight hits theaters July 18th, 2008. Hey Tommy – nice site you have there. I especially like the post about the Batman logo mp3 player. Oh man! The “Joker Face” poster is GREAT but the one with the BAT-POD bursting through the window is my favorite!! This movie is gonna ROCK!